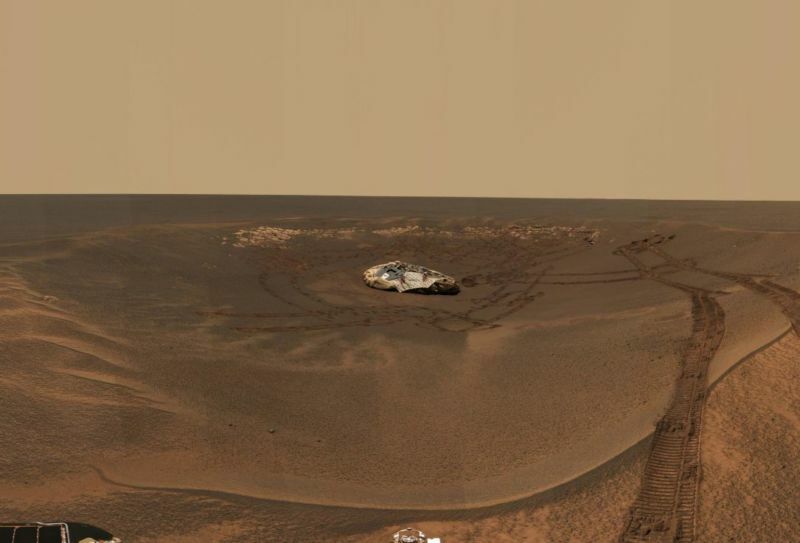 The Opportunity rover leaves its landing site in Eagle Crater on Mars back in 2004. The scientists waited to hear some response from their long-silent rover, which had been engulfed in a global dust storm last June, likely coating its solar panels in a fatal layer of dust. Since then, the team of scientists and engineers have sent more than 835 commands, hoping the rover will wake up from its long slumber—that perhaps winds on Mars might have blown off some of the dust that covered the panels. So on Tuesday night, they listened. They reminisced. But in the end, no response came. Opportunity would finally be declared dead on Sol 5352, as in five thousand, three hundred, and fifty-two days on Mars. NASA is expected to make it official at 2pm ET Wednesday, when NASA Administrator Jim Bridenstine and the chief of the agency's science division, Thomas Zurbuchen, convene a news conference. Opportunity landed on Mars more than 15 Earth years ago, on January 25, 2004. So much time has passed since then. Facebook would not be created until a month later. YouTube would not get its first video upload for more than a year. George W. Bush was still in his first presidency. NASA's Cassini spacecraft had not yet even arrived in the Saturn system. And yet from that moment on, Opportunity and its sister rover,Spirit, began plugging along the surface of Mars. Originally designed for 90-day lifetimes, the rovers persisted. Spirit lasted until 2010, when its batteries were unable to keep the spacecraft's critical components from freezing. But Opportunity kept on keeping on amidst the harsh terrain. It roved a staggering 45.16 kilometers across the red planet, a distance unmatched by any rover on the Moon or Mars. In 2016, as it climbed a hill, Opportunity's tilt reached 32 degrees, the steepest ever for any rover on Mars. The rover's primary task on Mars was to better understand the planet's geology and understand the history of water there. It succeeded. In one discovery, for example, it found evidence of ancient hydrothermal vents that would have existed beneath a warm, shallow lake. When the dust storm originally engulfed Opportunity last year, mission scientists were hopeful they might yet recover the rover. Sure, it had to steer with just two instead of four wheels, and the rover was showing its age. But even then, its batteries had retained 85 percent of their original capacity. But now, NASA scientists know it will never emerge from Perseverance Valley, a feature carved into the rim of Endeavor Crater by flowing water in a distant age. Spirit and Opportunity will not soon be forgotten. Their success led NASA to the development of larger rovers, including Curiosity and the forthcoming Mars 2020 rovers. Those two rovers carry considerably more scientific equipment and will probe deeper into Mars' watery past and whether it might have once supported life. Perhaps, most of all, Spirit and Opportunity will be celebrated for their dogged survival in harsh conditions. One day, not in the movies but in real life, humans hopefully will visit the sites of these two rovers to marvel at their crude technology, dusty graves, and historic accomplishments. This would be humanity's best tribute to these two early Martian pioneers—that they were not the end of human exploration of Mars, but the beginning. Tu toe za matanga ?